I’m really thrilled to share this collaboration with you because it’s not only inspiring and exciting but deliciously beautiful and fun! I first met Stephanie early last spring, shortly after moving to WA. We realized that we were island neighbors on Lummi, and we got to know one another over cozy shared meals and impromptu beach hangouts. Stephanie Eburah is a creative wonder woman; she’s a divine cook, a talented photographer, an avid gardener, and a wholehearted mother and wife to her rad family. Plus, she is a whiz at creating gatherings that are gorgeous, meaningful, and memorable. I reached out to Stephanie because I wanted to feature her collaboration with Cambria Cox of Field Trip Society; their dynamic events, workshops, and retreats are stunning and impeccably styled, and their intention and thoughtfulness shine in their work. So sit back and enjoy this treat of a feature! Stephanie studied photography in college but has a true passion for food. She spent 10 years cooking professionally in the Bay Area - from owning a food truck to fine dining to founding a caviar company where she developed products with the likes of Jacques Pepin. After starting a family and moving to Seattle she felt the strong urge to get back behind the camera shooting what she loves most, food and the lifestyle of eating. 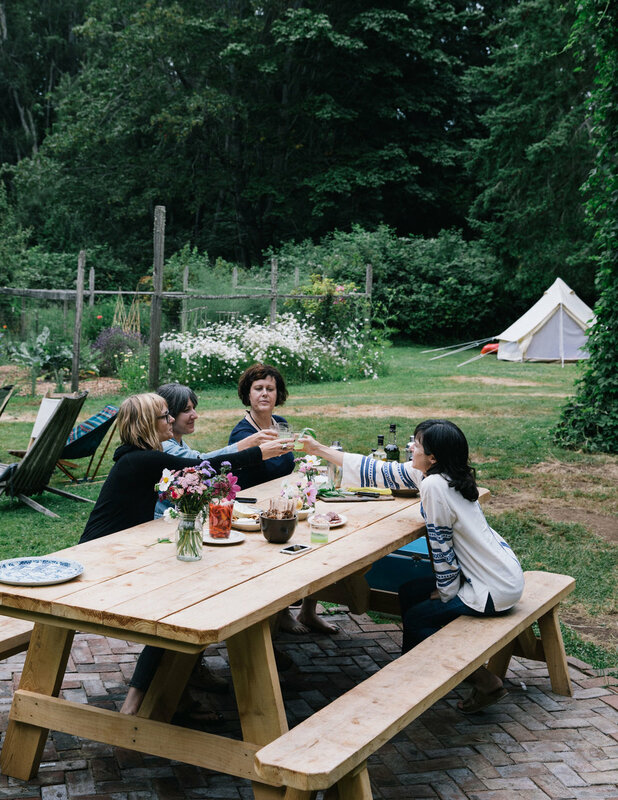 When not photographing food she splits her time between Seattle and her home on Lummi island where she hosts community dinners and culinary retreats because she believes food tastes better with good company and there is nothing more enjoyable than sharing the table. Cambria founded the Field Trip Society to offer opportunities to broaden one’s knowledge, invite others to dabble in something new, and encourage people to learn even more. Field Trip Society partners with experts who are passionate about what they do and are eager to share it with others. FTS isn’t confined to a static classroom or event venue, instead, classes and events take place in restaurants, homes, shops, parks or anywhere else our curiosity takes us. Describe your current collaboration or a past collaboration. With whom do/did you collaborate? What are your shared goals and purpose? I collaborated with Cambria cox of Field Trip Society to host what we called Camp Lummi, a 2-night campout on my property on Lummi Island. Field Trip Society's motto is Semper quaerens, which translates to "always curious, always seeking," and Cambria offers classes to adult field trippers to broaden their knowledge, try something new and become inspired to learn more. Our guests were taught crafts ranging from macrame jewelry to floral arranging to making mobiles out of foraged items from the beach. They were also taught tai-chi, how to shuck an oyster and given a champagne and caviar pairing. We finished the weekend with a guided kayak tour around the island where we foraged for seaweed and cooked lunch with it on the beach. What inspired you to collaborate? I am always seeking the opportunity to learn something new so I was instantly drawn to Cambria and what she does. I also find I am happiest when I am cooking for people. Especially bringing like-minded strangers together around the table to share a meal and make friends. Camp Lummi was a perfect collaboration of a full day of classes interspersed around shared meals. What do you love about collaborating? Being inspired and validated by one another which, for me, builds confidence in what I am doing. When you share the same vision and aesthetic with someone, the work is just more fun. You build off one another making the final product that much better. What kind of challenges did you or do you face? There is always some sort of compromise you make when collaborating. Maybe one person finds something more important than the other, etc. With this particular event I found just keeping the timing going the biggest challenge. We could have done a better job checking in with each other often to make sure the day went smoothly and everyone was able to have a chance to do everything. We were both super organized ahead of time so things went smoothly. Our guests had a good time and we had fun doing it. What advice do you have for someone who is considering developing a collaboration? Make sure your communication is super clear. You are both on the same page and share the same vision. Thanks, Stephanie and Cambria! Best of luck with your future collaborations. Learn more about Stephanie here, and check out Field Trip Society. Are you considering starting a collaboration? Be sure to read this post that outlines our the foundations for how to build a successful creative collaboration.